A sweet and tart pickle usually served for traditional feast in Kerala. All the gravy seen here dries up once the pickle cools down so please add more water if u want. 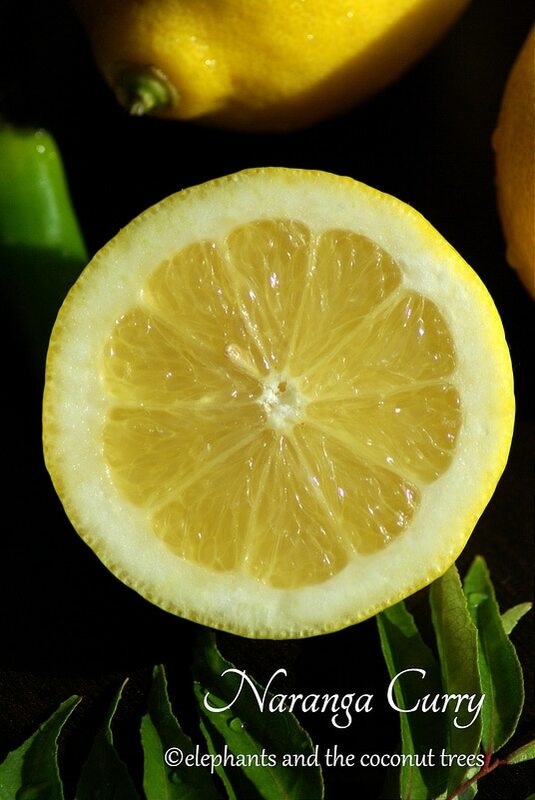 1.Cut the lemon into small bits keep aside also mix chili powder, coriander powder, asafoetida, fenugreek and salt adding 1/2 cup water and keep it ready. 2.Heat oil add mustard when it crackles add whole red chili pieces, curry leaves add lemon bits and green chili and fry until the lemon becomes brown and almost crisp remove and keep aside. 3.Then in the same pan pour the powders mixed in water and more water if needed (enough to cover the lemon)let it boil now add lemon fried and boil until it thickens.Add the jaggery piece switch off flame.Once it is cool keep it in an airtight bottle.It can be used immediately. If you do not get vadugapuli naranga use really large lemon with slightly thick peel like I have used here. If the lemon is not tangy and sour enough some tamarind squeezed (or around 1 tsp paste)also should be added along with the spice powders in step 2.I did not use tamarind as pickle gets spoilt with in 2-3 days -according to Amma. Nice to know about traditional eating during festival. You are right about caught on tape , doing something silly that's why we didn't go for traditional way. I love lemon pickle , going to try soon. Making me salivate. Wrote down the recipe and its on tomorrow. Ahh those pics are so amazing…vaayil kappal odunnu…nalla eruvum puliyum ulla achar..
OOh i love it…looks so perfect! The pickle sounds fabulous…the spices, the color, the texture…wow! welcome back.. So tempting can I hv some? Njan vicharichu evideinnu vadukapulli narangai kitti ennu. Adipoli, Love this spicy Achar meena. Vadukapuli naranga evide innu kitti ennu vicharichu. Adipoli, kollam, Love this spicy pickle. My mouth is watering after watching these pics, wonderful recipe. lovely pickle and fabulous Clicks !